Chess Openings for Kids by John Watson (English) Hardcover Book Free Shipping! Chess Endgames for Kids by Karsten Muller. Grandmaster Alexei Shirov's best selling books, Fire on Board and Fire on Board Volume 2 are now brought together in a single volume. 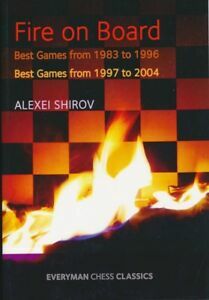 ln this collection of his best games from 1983 to 2004, Grandmaster Alexei Shirov shows why he is widely regarded as one of the most aggressive and inventive players of the modern era. lt contains a delightful selection of his favourite games, each of which is explained in detail, together with sections on tactical highlights and endgames. Special attention is devoted to the super-sharp Botvinnik variation, which Shirov has used to remarkable effect against the world's leading players. Since becoming a grandmaster in 1990, Alexei Shirov has firmly established himself amongst the world's leading players. His many tournament successes include first place at Munich in 1993 and equal second with Kasparov behind Karpov at Linares in 1994. His penchant for wild attacking games has made him a great favourite with the chess public, who see him as natural heir to another Latvian, the former world champion Mikhail Tal.